We’d love your help. Let us know what’s wrong with this preview of Awake Under the Night Sky by Vanya Sharma. To ask other readers questions about Awake Under the Night Sky, please sign up. It’s been a long time since I felt sweet about a love story. This is one of those books which bring smiles on your face and butterflies in your stomach. Oh, I cannot say how much I love this pair of love birds Andre and Vivian, the sweetest and always-a-teenager kind of couple. The story was lovely and predictable. Fast paced but when the couple was together it would get slow and in detail, their feelings, their thoughts, their every second is counted when they are together but a blur when they a It’s been a long time since I felt sweet about a love story. This is one of those books which bring smiles on your face and butterflies in your stomach. Oh, I cannot say how much I love this pair of love birds Andre and Vivian, the sweetest and always-a-teenager kind of couple. The story was lovely and predictable. Fast paced but when the couple was together it would get slow and in detail, their feelings, their thoughts, their every second is counted when they are together but a blur when they are not, this was the thing I like but also not. There wasn’t anything special that I love most about the book but neither there was anything which I particularly don’t like. We can say that it was a thick but light read and full of feelings, good and giddy feelings most of the time though there was one time in the very end when I wanted to cry but I cannot tell you why because that will mean spoilers. But the book, as I progressed into, was predictable which gave away it’s little thrill we have in love stories. The characters, I love the, not only the couple in spotlight but all. The author somehow put something good in every character making them special in some way or other. Even with more than half of the book the couple wasn’t together even though they wanted to there wasn’t any depression. The author kept the things light even in dark but it doesn’t mean the story lacks any feelings, it was full of it. It is a kind of book that is loved by even non love story readers and loved immensely love story ones so recommending it to all who dream of sweet loves. What an amazingly heartwarming and romantic story! This story gave me butterflies in my stomach and longing in my heart. So beautifully written and woven together. I couldn't put this book down, I just had to know what was going to happen. The characters are beautifully created and touched my heart and soul. The ending had me in tears of sorrow and was deeply touching. This is the loveliest romance I've read in a very long time. It’s a story of two young people who meet while they’re studying in India and fall deeply in love. But each have ambitions that drive them apart geographically. Vivian…to follow in the footsteps of her humanitarian grandmother, wanting to make a difference in third-world countries, and Andrea who has pledged to make a suc This was a romance. A sweet and charming romance, but it lacked maturity, and reminded me more of a YA or serialised magazine story…in something like Woman’s Weekly or The Lady. It’s a story of two young people who meet while they’re studying in India and fall deeply in love. But each have ambitions that drive them apart geographically. Vivian…to follow in the footsteps of her humanitarian grandmother, wanting to make a difference in third-world countries, and Andrea who has pledged to make a success of his father’s ailing glass factory in Venice. Each does his and her best to forget and move on from the love they shared, but, as they find, it’s an obstacle they find hard to overcome. When I look at this front cover to this book, it takes me to a far away place. It's simply stunning the way the cover has been split in to two half's. At the to a young couple are having a cuddle under a starry sky, looking completely comfortable and at ease with each other. Under the title a woodland, a lake with a row-boat bobbing in the middle and buildings poking through the tops of the trees. The author's name is situated in the lake. I think it's safe to say I blooming adore this front cover very much! Great design and I can say now I've read it, it's pretty perfect for this story! Andre; a twenty year old man, is suddenly in the clutches of his past. After an accident and being rescued by his father; Andre knows what he has to do for his future. He want's to get his father's Italian glass factory back to what it used to be, and is determined to do so. When his father get's a job in New Deli, they both agree this will be good for them to get away from the past for a while. Andre is thrust into a new country and new college. His clear plan and determination shines through his study's. When he meet's the beautiful Vivian he doesn't count on falling head over heals with her. Vivian moves to New Deli with her family to start college. After taking a trip with her grandmother to Africa; where she see's first hand the poverty, neglect and a place that need so much help. Heartbroken by what she see's but it gives her the determination to study hard and follow in her grandmother's footsteps to go back and help these people. But she doesn't count on fall in for Andre! Andre and Vivian spend many of their free hours together, falling madly and deeply in love with each other. The both accept each other's clear goals they each have but they will take them into different country's and they both struggle with not being together. Andre makes a drastic decision to end their relationship and set Vivian free. It breaks both their hearts but one things they do know is that they both have things that drive them forward to their goals. But has Andre done the right thing? Will they find any happiness without each other? Will they both achieve their goals? Will their path's cross through the years? How will they react if they do? Will they admit they want to be together? Or will they try to find happiness else where? From the very first chapter I felt so enchanted and wrapped up in Andre and Vivian's love story. The intensity of their relationship is truly addictive to read and made me what to read on. I feel Vanya has really written a very refreshing, emotional story and has a genuine talented for writing. I really felt immersed on a deep level in this story to the point that what ever was going on around me, well I was not really aware of it!!!! I thoughly enjoyed every second of Awake Under The Night Sky and I can't recommend this beautifully written story enough! I'm defiantly re-reading again at some point for sure!!!!!! I’ve found another new author that I look forward to reading more books by. This is a well written book. I would highly recommend this book to everyone. I won this book through a giveaway on Goodreads website. Witness to the rav I received a free copy of this book in exchange for a fair and honest review. All opinions are my own. I loved this story. It was incredibly emotional throughout the entire read. Its an interesting concept, as it showcases that we do not always know when or if we will find love, and how that love will impact the dreams we once had. It makes us as readers question what is more important in life: one's dreams or true love? It also showcases how outside forces can intervene and cloud our minds in the face of love, and how our lives are forever impacted by that found love, both good and bad. The only small critique I have is that the book ends surprisingly abrupt. This may be a creative choice by the author, but it was shocking as you expected a final scene to play out and instead were left to draw your own conclusions on how things played out in the end. While readers will have a good idea of where things go from there, you become so invested in these two characters that you are left breathlessly wanting more, or at the very least to have confirmation as to these two lover's fates. Other than that the author does a wonderful job of drawing the reader's emotions out through this powerful romance. As the Valentine's Day holiday passes, this book is a great way to keep romance alive and witness the way love changes us forever. Overall this was a wonderfully written book with a beautiful story and rich characters throughout. Exploring various cultures and backgrounds, the story does a great job of connecting people from different worlds through one singular and purposeful thing, and that's love. If you haven't yet be sure to pick up your copies of Awake Under the Night Sky by Vanya Sharma today! Awake Under the Night Sky by Vanya Sharma follows two young people navigating life’s labyrinth. Andre dreams of reopening his parents’ glass factory in Italy. Vivian, following her grandmother’s footsteps, wishes to provide medical assistance to the poor in Ghana. Crossing paths at a university in India, they unsurprisingly dive into a whirlwind romance in spite of their radically different lives. The plot twists and turns through the ups and downs of their relationship. While the book begins wit Awake Under the Night Sky by Vanya Sharma follows two young people navigating life’s labyrinth. Andre dreams of reopening his parents’ glass factory in Italy. Vivian, following her grandmother’s footsteps, wishes to provide medical assistance to the poor in Ghana. Crossing paths at a university in India, they unsurprisingly dive into a whirlwind romance in spite of their radically different lives. The plot twists and turns through the ups and downs of their relationship. While the book begins with a bit of unnecessary character backstory, the real story emerges at the first encounter of the young couple in India. Sharma creates relatable protagonists in real-life situations where Andre and Vivian face the common conundrums of any young couple. They must ask themselves: what is worth sacrificing? What does a life together look like? Is this in fact true love or a passing fling? And ultimately, what if? The story lies in the answers. This was a light-hearted but inspirational read. The characters came to life and the faith and hope drenched the pages. Vivian is a character filled with compassion and goodness, and is devoted to helping others. She is one of those characters that bring to life the part of humanity that even humanity is missing. Sharma writes well and shows a good story, connecting lightness that overshadows darkness and using humor to gain some levity. I'd like to thank Vanya Sharma for sending me a review copy of her book, it is much appreciated! This is a book about the story of how two people come to be together in the end and it was lovely. This would have easily been a four star review if I hadn't been in a small reading slump near the beginning of reading, it is three stars for the fact that I took a little break in the middle and can't remember the beginning all too well. 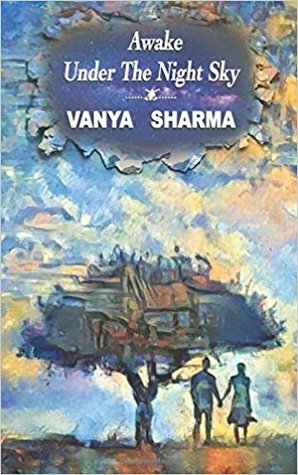 "Two people on the threshold of their lives, touched by love but dr I'd like to thank Vanya Sharma for sending me a review copy of her book, it is much appreciated! "Two people on the threshold of their lives, touched by love but driven by duty, following separate destinies. He has a past to restore, she has a future to change. Are their paths destined never to converge, or might the vagaries of fate unlock the buried dreams of two proud hearts, and offer a new beginning?" I need to say, that, I love a good romance book that is full of cliches and this book did not disappoint in the slightest! Some people might not like that there love was almost instant and it seemed rushed, but for me, there is nothing better if I am honest. I'm a sucker for instalove. I think that this instalove was made better due to the fact that they couldn't even be together for the majority of the book, but, you know romance books, they always find their way to each other somehow and this book... this book was a hell of a journey that i loved following. From exes, to current partners, to fiances and weddings, they somehow found their way back to one another. One thing that I was a little stumped on was the fact that the main characters were from different countries, and studying in another country, and there was no difficulty in conversing between one another. Andre was Italian and Vivian was Spanish, and they both studied in India, where I assumed most people would be speaking, of course, Indian. I thought that since both Andre and Vivian could speak English, they were brought up in an English speaking part of each of their home countries, and the people they were placed with in India were also from English speaking backgrounds, this is the only way I was able to wrap my head around it. I am in no way critiquing it, I didn't really even notice, for some reason, until a few chapters from the end! I was a bit shocked that the book ended so abruptly but this doesn't mean that I dislike how it ended, not at all. I think that if the final few chapters were to be fleshed out a bit more, I would have a bit more to say about the ending. I will write a clear-rated, in-depth star via my blog when I write the full review. 'Awake Under the Night Sky' is a romance novel that I would most likely label romance/coming-of-age (though I feel like the coming-of-age applies more to Vivian) just because of the way the characters ventured during their younger years. The strong points that really made this novel stand out, was it's true to nature romance, giving ode to old romance novels and the way they tied the characters in. There were mom I will write a clear-rated, in-depth star via my blog when I write the full review. 'Awake Under the Night Sky' is a romance novel that I would most likely label romance/coming-of-age (though I feel like the coming-of-age applies more to Vivian) just because of the way the characters ventured during their younger years. The strong points that really made this novel stand out, was it's true to nature romance, giving ode to old romance novels and the way they tied the characters in. There were moments that invigorated me with description. Specifically moments tying into the parts where the two main characters were together and more intimate. However, there were also moments where that same descriptive passion, I believe, should have been fleshed out towards moments in the book that would hit the sensors of the readers. Specifically places that they went to in India. India is a large area and I would have loved to get a feeling of the smells, the markets, even the uncomfortable areas which she emphasized in the book where men kept staring at Vivian. The descriptions were short and simple but those were the big parts that should have been made alive. The second half of the novel hit more of the reality of things than the first part, but I also appreciate that. The first part of the novel gives you that fantasy feeling of what people visual, what they want when they first fall in love. It can even be described as dream-like. Surreal even. And then the second half hits with the hard reality of what we really have to go through as individuals. The fantasy wall is broken down and shattered and we go day-to-day. Was recommended this book by my friend who is a blogger and I have to say it was an excellent recommendation. Thoroughly enjoyed the read especially the romance between Andre and Vivian. It was so soft and sweet, oozing with emotions. The start is not a traditional romance novel start but it gets much better once the love story kicks in. I don’t mind the start, it gives the book a different flavour but the love story is what makes this book stand out. 5 super stars and highly recommended. Brilliant, it was a pleasant surprise. It is not your standard romance, something similar to Nicholas Sparks books. But all in all, I quite liked it. Very refreshing read, highly recommended. Vanya Sharma was born in India and has spent much of her life travelling, living in cities around the world. It was through her grandfather’s storytelling that she developed her passion for writing. She now lives in England with her husband and two daughters and is a full-time working mum.